A textile artist by training, John Martono’s approach to his art is experimental and intuitive. Martono creates his artwork using acrylic paint on silk fabric with free painterly manner. Restrained by the absorbency quality of the silk, Martono adopts a process to capitalize on silk’s special quality. The work surface is laid flat on the ground while Martono deploys colors in large area. 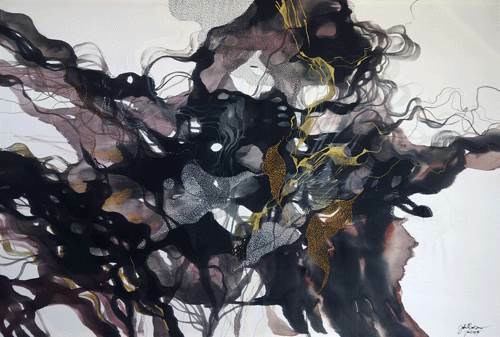 With his background in textile science and technique, Martono incorporates embroidery onto his work to create textural effect to his abstract compositions.